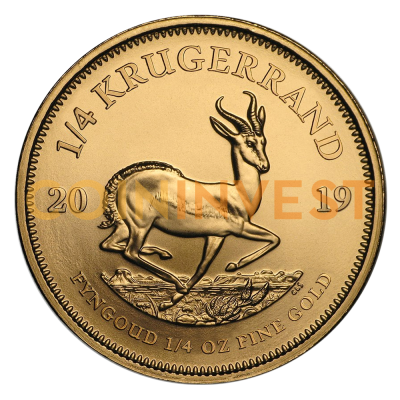 Grab your2019 1/4 oz Gold Krugerrand coins now at coininvest.com. One of the world’s most successful coins, the original 1 oz gold Krugerrand was the first bullion coin created purely for investment purposes. Valued for its timeless obverse and reverse designs as well as for its gold content, the Krugerrand continues to captivate numismatists across the globe. Fractional coins are a smart alternative to larger denominations, offering an easy and affordable way to boost your holdings with fine 916.7 gold. They’re also the ideal way to introduce younger friends or family members to the exciting world of precious metals and make a wonderful gift for special occasions. Manufactured with the skill and attention to detail that has made the Rand Refinery, South Africa one of the most prestigious in the world, each 2019 1/4 oz Gold Krugerrand has all the elegant details as its larger counterparts. The coin’s reverse shows the springbok antelope, an enduring symbol of South Africa, while its reverse carries the classic portrait of Paul Kruger, founder of the Republic of South Africa. What makes the 1/4 oz 2019 gold Krugerrand special? When you choose these exceptional gold bullion coins, you’re gaining a sound investment and a little piece of South African history. Like all highly-popular gold bullion coins, the 2019 ¼ oz Krugerrand is very much in demand. Order yours now with CoinInvest for fast, insured delivery.